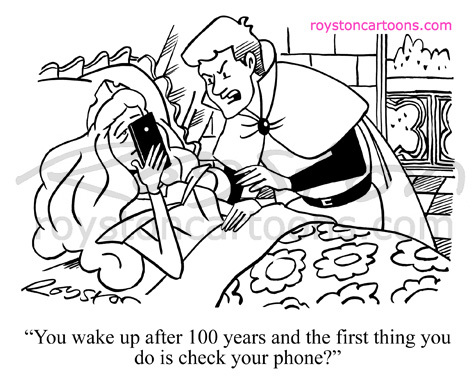 "You wake up after 100 years and the first thing you do is check your phone?" Sometimes, though not very often, it's possible to write a new caption for a rejected topical cartoon. This one was originally about #wakeupcall selfies. Remember that craze? I wouldn't be at all surprised if you didn't. It was billed as the new #icebucketchallenge but unlike that craze it seemed to fall out of fashion just as my gag was hitting the desks of cartoon editors. So it was dead on arrival. However, I decided it could be reworked as a more general joke about the way we use phones and off it went again. It appears in this week's Spectator. I also removed a "with apologies" from the signature, because although the drawing is clearly based on Disney's Sleeping Beauty, the fairytale is not an exclusively Disney thing and it felt like that was getting in the way of the joke somehow. It is, of course, yet another cartoon about technology. You can see lots more in my book Cartoons on Demand.